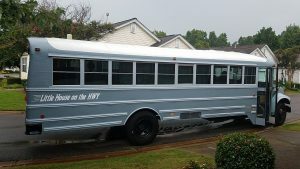 Elizabeth Hensley and her partner of eight years, Richard Tilford, have been traveling fulltime in their 1996 Thomas International skoolie, dubbed Little House on the HWY, since August 1. They are currently making their way from Florida to Maryland for the Mid-Atlantic Tiny House Expo. “We paid $2,500 for it in Bradenton, Florida,” said Tilford from a Dunkin Donuts in New Bern, North Carolina, where the couple had stopped for coffee. “We like coffee,” he added with a chuckle. 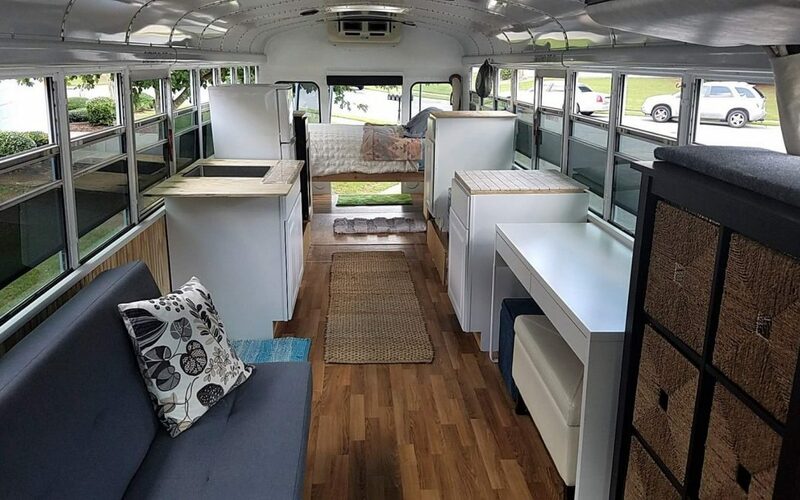 The couple gave notice to their landlord in May, and then it was a mad rush to get the skoolie ready for occupancy before they had to move out of their home. “Sleeping without AC can be tough. I sometimes lay down on a towel and sleep with no covers and sweat all night,” said Tilford. “We’re driving north partly to see the leaves change and to cool off. It’s already cooler in North Carolina than it was in Florida,” added Hensley. Hensley and Tilford freelance and work at odd jobs to pay for their lifestyle. “I recently wrote an article for Snowbirds and RV Travelers Magazine,” said Hensley. “And I buy and sell coins on eBay. Also, I just removed the carpet from an RV and installed wood floors. 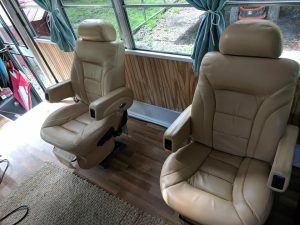 The owner gave us the seats from the RV which were nice, and they had seatbelts, which we were glad about,” said Tilford. “Going slower saves money. Sixty-five MPH in this bus isn’t very good. It vibrates a lot and is noisy at that speed. We like to keep it at 50 or slower for a smoother ride and to save fuel. So, we use back roads when we can,” said Tilford. “We also don’t have any kids or pets, so that helps make this possible. You really find out how much you don’t need to live when you’re on the road. We don’t need a house and two cars,” said Hensley. Richard and Elizabeth met in Hawaii when they were both working on a cruise ship for Norwegian Cruise Lines. Elizabeth was from California originally. Richard was from Florida. They have lived in California, Florida and Georgia as a couple. The couple is grateful to have the resources and flexibility to travel where they are drawn by weather, events and other circumstances. 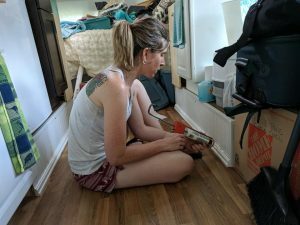 “We headed to North Carolina because we thought we would try to help out following Hurricane Florence. We’ve met some people who lost everything. Some people said they were fine. 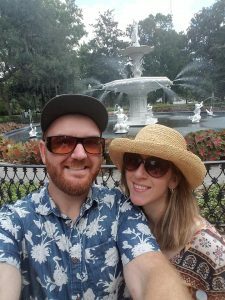 We drove up through Charleston yesterday and found out about the Maryland tiny house expo from a woman we met there,” recalled Hensley. “We’re glad we’re going to be part of this expo. This will be our first tiny house event, and we hope to learn more about tiny living,” said Tilford. “I was insuring the bus as a commercial vehicle, as a sole proprietorship. You need a business name. It really felt like homesteading. And it reminded me of the Laurel Ingles Wilder books. They were homesteading,” said Hensley. “We’re on the Oregon Trail and this is our wagon,” said Tilford. Elizabeth and Richard’s bus is featured on YouTube, Instagram and Facebook. You can tour it and meet them at the Mid-Atlantic Tiny House Expo in Maryland on October 6-7.